The first step in tackling anti-Semitism within the Labour Party is to admit that it is happening. We as activists should also retain our sense of anger that such a poison could find its way into our party — but we must also keep the scale of it in proportion . There is neither an epidemic of prejudice against Jews in Labour, nor is it non-existent. The sorry saga of suspensions and bans last year testifies to its presence, as do the words of Ruth Smeeth, the backbencher who has told of death threats and how she was forced to move house. These suggestions of how to tackle anti-Semitism are, of course, just part of the answer in how to tackle the oldest prejudice when it rears its head on the left. They are where I began when yesterday I was asked the question of what to do next. I was speaking at the Jewish Labour Movement’s first annual conference. It took place in north London and attracted prominent MPs including Stella Creasy and John Mann as well as Smeeth. There was much on the agenda beyond the bigotry — and that is how it should be. 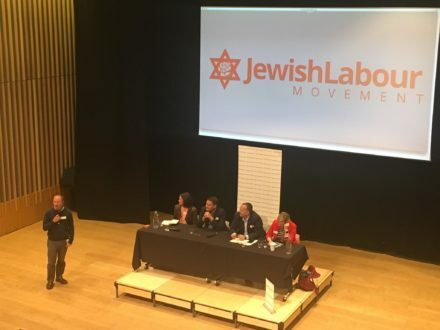 Activists Jew and non-Jew debated how to get Labour back into power, how the party could win back newspaper support and, of course, how it should navigate the next two years of Brexit negotiations. Questions covered all of these topics but there was a focus and a concern about anti-Semitism in the party. I took part in a panel on how bloggers covered the current state of the Labour party and was asked about prejudice. I don’t pretend to have all the answers but my prescription was simple: first, the party has to admit there is anti-Semitism. That does not mean believing all the newspaper headlines about it being “widespread”, but neither does it mean denying its existence. And when I said activists should feel angry about it, that was because I do so myself. If it is channelled constructively, then that anger should help us drive out intolerant attitudes. Where anti-Semitism does exist, it shames our party. This is the Labour party that has fought to end discrimination on the grounds of race, ethnicity, gender, sexuality and disability for a century. This is the labour movement that came together with Jews, Irish men and women and communists to see off the fascists in the battle of Cable Street in 1936. And this is the movement that was at the heart of the Grunwick Strike in 1976, when Gujarati workers from East Africa fought bosses over low pay and appalling working conditions. So any episode of anti-Semitism runs contrary to the values which have been held by our party for decades. It is also, of course, unnecessary and unwise to alienate any racial or religious grouping if a party is serious about getting into power. The Labour party exists to get into government because government is the best place to deliver change, and no Labour leader can make it into Downing Street if they are not seen as tough in tackling prejudice. This is not an article about Jeremy Corbyn, but he is the leader of the Labour party and is almost certain to take us into the next election. I don’t believe for one moment that Corbyn holds anti-Semitic views. I do want him to do far more, however, to drive out this form of hatred from whichever dark pocket it exists in our party. So whether for reasons of pragmatic political appeal, or high principle, or both, we must be vigilant about tackling anti-Semitism. The leader’s office must play a major part in this and create a culture in which anti-Semitism is seen as unacceptable everywhere in our party. As for the rest of us, we must retain our sense of anger and continue to speak out. Prejudice against Jews insults our people, our party, our values and the rest of our society.